A new automated line in Seoul, South Korea, was inaugurated on 2 September. Ui-Sinseol LRT, the first fully underground metro line in Korea, connects 13 stops (11.4km) from Ui-dong in Gangbuk-gu to Sinseol-dong in Dongdaemun-gu. The line has connections with metro lines 1 and 2 at Sinseol-dong and with Line 4 at Sungshin Women’s University. 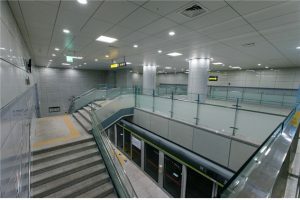 The opening was originally scheduled at the end of July but was delayed to allow further testing after the Seoul government requested that headways between trains were increased from two-and-a-half to three minutes. The vehicle fleet is composed of 18 2-car trains, supplied by Hyundai Rotem, which are 28-meter long. All 13 stations have platform screen doors. With the opening of the new line in the area where buses were the only means of public transportation, the commute time is expected to be reduced by 30 minutes during rush hour in the Ui-Sinseol area. 2,755 additional staff will be stationed at Ui LRT to ensure thorough safety management during the initial stages of operation. All stations and trains will have 95 staff members daily over 29 days. 403 CCTVs will be installed at compartments and stops and monitored by the general control tower 24/7. 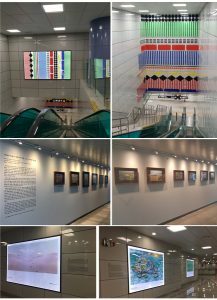 All 13 stations on the Ui-Sinseol LRT line are formed as art and culture space free of commercial advertisements. Walls, floors, staircases and the walls of escalators display works by up-and-coming artists. Some trains will be operated as “Running Series” trains wrapped up in a certain theme. The line is operated by UiTrans LRT Co., Ltd., a subsidiary of POSCO. UiTrans obtained the operating right for 30 years from the Seoul Metropolitan Government.